Tired of using your screen door as part of your exercise routine? If so, then it is time for you to replace your worn-out screen door rollers. By following these step by step instructions, we hope to guide you through the screen door roller selection and replacement process. After you complete the reading for each step, you should be able to remove your screen door from it's track, remove the roller from the door and with your roller in hand, select and purchase the replacement roller from your local hardware store, then install the new roller and remount your door. Please remember that there are hundreds of door manufacturers, all making four or five door models each, so you need to be prepared for the possibility that you may encounter some small variations from our step-by-step instructions. If you don't find your roller listed or your roller replacement experience was different than described below, please feel free to write us an e-mail and tell us about it so we can add it to our guide. Here is a video to go along with the step-by-step instructions below to help guild you through the process. Most screen doors use spring-loaded rollers to keep the door from jumping off of the track. First lift your door up and down in the track. Check if there is enough room to remove your door without adjusting the rollers. If you can remove the door, go to Step 2 (Figure 2). If not, please continue to Step 1 (Figure 1). Step 2. Use a slotted screwdriver to "pop" the rollers off the track. Step 3. Now swing the bottom of the door out until you can drop the door down and out of the top track. Place your screen door on a worktable or sawhorse. Step 4. Look into the frame of the door and identify the roller style that you need from the chart below. Follow the specific instructions to remove that style of roller. Example: As with this roller type, you can see that a slotted screwdriver is needed to lift the spring off the adjustment screw (Figure 4A). Now you can pull out and replace the roller (Figure 4B). Locate and remove the roller mounting screw at the bottom of the door. The screw should be above the adjustment screw hole. Now pull out the roller from the door frame, using pliers if needed. This style of roller has dimples in the housing to lock the inner housing up inside the outer housing, to help with installation. Screw the new roller in and snap the inner frame into the outer frame. Re-hang your door. Once you start turning the adjustment screw (clockwise), the inner frame will snap back out. 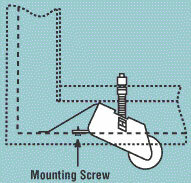 The mounting screw for this roller is located at the end of the spring. Remove the screw with a Phillips screwdriver. Unless you needed to back off the adjustment screws to remove the door from it's frame you shouldn't need to adjust the height of the new rollers. Remove the two (2) mounting screws found at the bottom of the door. The screws will be on each side of the wheel. Pull the roller out of it's slot. With a slotted screwdriver, wedge between the spring end and the door tab and push off. 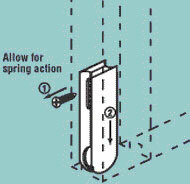 Then push the spring inward and out between the door tabs. Install the new roller by looping the spring through the tabs and using the screwdriver as a wedge in the opening to snap the spring onto the tab. Remove the roller mounting screw located on the bottom of the door next to the roller. Make note of the spring's placement and then swing the roller out. 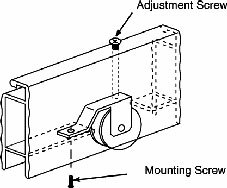 Since the adjustment screw stays on the roller, remember to guide the new roller's adjustment screw back into place as you mount the new rollers. Look into the roller door slot. You will see the mounting screw at the end of the leaf spring. With a Phillips screwdriver, remove the screw and pull out the roller. Since the adjustment screw is at the top of the roller, you usually do not need to worry about adjusting your door after replacing the roller. Loosen or remove the roller mounting screw that is located about 2" from the bottom on the edge of the door. 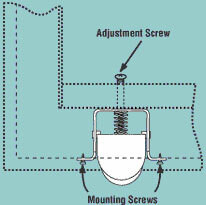 The roller mounting screw is usually found right above the adjustment screw hole. Now pull out the roller from its door frame, using pliers if needed. 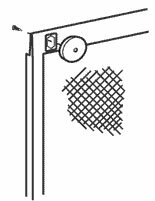 Replacing a top-hung screen door's rollers may require you to loosen the top track rollers with a small wrench so you can lift your door up and out of the bottom guide. Swing the door approximately 45 degrees and tilt the door out. With a screwdriver, replace the rollers, mounting the new ones in the same locations. The roller's mounting screw is located about 2" from the bottom, at the edge of the door. 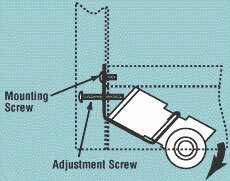 Make note of how the mounting screw is situated between the roller's frame and the top of the coil spring. 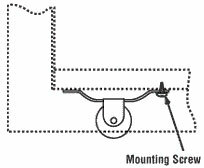 Remove the mounting screw. This function gives the roller the anti-jump feature. Pull out the roller through the bottom, using pliers if needed. Slide the new roller into the door channel and then push the mounting/adjusting screw in-between the roller housing and spring, through the slot in the door. After you re-mount the door, push the adjustment screw down and tighten it to raise the door. First look into the roller opening and make note of the spring's placement. Remove the roller mounting screw located on top of the door frame, above the roller. Pull out the roller from the bottom. Step 5. To the hardware store! With roller in hand, compare your roller to our display. First match up the roller housing and/or spring shape. Is the roller wheel the same diameter and material as yours? Changing to a steel or nylon ball-bearing wheel will make your door roll easier. If you can't find a match, check with the special order desk, as they should be able to order your replacement rollers for you. Step 6. Install your new rollers the same way you removed the old ones. There is no need to add any lubricant, as it will only attract dirt and dust. Our bearings are greased at the factory. Step 7. Lift your door back into it's top track while tilting the bottom of the door as close to it's bottom track as you can get. While lifting up, try to get the bottom rollers onto the track. If you are having problems, try using the slotted screwdriver trick: Lift the door on the edge of the wheel with the screwdriver and lever it up and over onto the track (Figure 7). Step 8. Here the adjustment screw is on top of the rail (Figure 8). Unless you needed to drop your door to remove it, you will find with most installations you will not need to re-adjust your door height. But, if adjustment is needed, turn screw clockwise to raise that side of the door. Square your screen door in relation to the jamb and check that your latch locks properly at that height. 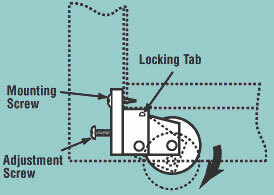 If not, adjust the latch strike first before trying to re-adjust the rollers again (Figure 9).